The core of the group that would come to be known as the Pilgrims (known as the Pilgrim Fathers in the United Kingdom) were brought together by a common belief in the ideas promoted by Richard Clyfton, parson at All Saints’ Parish Church in Babworth, East Retford, Nottinghamshire, between 1586 and 1605. This congregation held Separatist beliefs comparable to nonconforming movements (i.e., groups not in communion with the Church of England) led by Henry Barrowe, John Greenwood and Robert Browne. Unlike conforming Puritan groups who maintained their membership in and allegiance to the Church of England, Separatists held that their differences with the Church of England were irreconcilable and that their worship should be organized independently of the trappings, traditions and organization of a central state church. William Brewster, a former diplomatic assistant to the Netherlands, was living in the Scrooby manor house, serving as postmaster for the village and bailiff to the Archbishop of York. Having been favorably impressed by Clyfton’s services, he had begun participating in Separatist services led by John Smyth in Gainsborough, Lincolnshire. The Separatists had long been controversial. Under the 1559 Act of Uniformity, it was illegal not to attend official Church of England services, with a fine of 12d (£0.05; 2005 equivalent: about £5) for each missed Sunday and holy day. The penalties for conducting unofficial services included imprisonment and larger fines. Under the policy of this time, Barrowe and Greenwood were executed for sedition in 1593. It had been hoped that when James came to power, a reconciliation allowing independence would be possible, but the Hampton Court Conference of 1604 denied substantially all the concessions requested by Puritans, save for an English translation of the Bible. Following the Conference, in 1605, Clyfton was declared a nonconformist and stripped of his position at Babworth. Brewster invited Clyfton to live at his home. Upon Hutton’s 1606 death, Tobias Matthew was elected as his replacement. Matthew, one of James’ chief supporters at the 1604 conference, promptly began a campaign to purge the archdiocese of nonconforming influences, both separatists and papists. Disobedient clergy were replaced, and prominent Separatists were confronted, fined, and imprisoned. He is credited with driving recusants out of the country. At about the same time, Brewster arranged for a congregation to meet privately at the Scrooby manor house. Beginning in 1606, services were held with Clyfton as pastor, John Robinson as teacher and Brewster as the presiding elder. Shortly thereafter, Smyth and members of the Gainsborough group moved on to Amsterdam. Brewster is known to have been fined £20 (2005 equivalent: about £2000) in absentia for his non-compliance with the church.This followed his September 1607 resignation from the postmaster position, about the time that the congregation had decided to follow the Smyth party to Amsterdam. In the Columbia Encyclopedia, it is stated that “Although not actively persecuted, the group was subjected to ecclesiastical investigation and to the mockery, criticism, and disfavor of their neighbors.”. Unable to obtain the papers necessary to leave England, members of the congregation agreed to leave surreptitiously, resorting to bribery to obtain passage. One documented attempt was in 1607, following Brewster’s resignation, when members of the congregation chartered a boat in Boston, Lincolnshire. This turned out to be a sting operation, with all arrested upon boarding. The entire party was jailed for one month awaiting arraignment, at which time all but seven were released. Missing from the record is for how long the remainder were held, but it is known that the leaders made it to Amsterdam about a year later. Ultimately, at least 150 of the congregation did make their way to Amsterdam, meeting up with the Smyth party, who had joined with the Exiled English Church led by Francis Johnson (1562-1617), Barrowe’s successor. The Scrooby party remained there for about one year, citing growing tensions between Smyth and Johnson.Smyth had embraced the idea of believer’s baptism, which Clyfton and Johnson opposed. Robinson decided that it would be best to remove his congregation from the fray, and permission to settle in Leiden was secured in 1609. With the congregation reconstituted as the English Exiled Church in Leyden, Robinson now became pastor; Clyfton, advanced in age, chose to stay behind in Amsterdam. “For these & other other reasons they removed to Leyden, a fair & bewtifull citie, and of a sweete situation, but made more famous by ye universitie wherwith it is adorned, in which of late had been so many learned man. But wanting that traffike by sea which Amerstdam injoyes, it was not so beneficiall for their outward means of living & estats. But being now hear pitchet they fell to such trads & imployments as they best could; valewing peace & their spirituall comforte above any other riches whatsoever. And at length they came to raise a competente & comforteable living, but with hard and continuall labor. Brewster had been teaching English at the university, and in 1615, Robinson enrolled to pursue his doctorate. There, he participated in a series of debates, particularly regarding the contentious issue of Calvinism versus Arminianism (siding with the Calvinists against the Remonstrants). See the Synod of Dort. 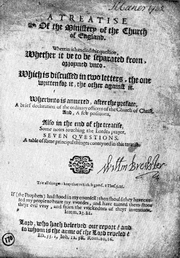 Brewster, in a venture financed by Thomas Brewer, acquired typesetting equipment about 1616 and began publishing the debates through a local press. The Netherlands was, however, a land whose culture and language were strange and difficult for the English congregation to understand or learn. Their children were becoming more and more Dutch as the years passed by. The congregation came to believe that they faced eventual extinction if they remained there. 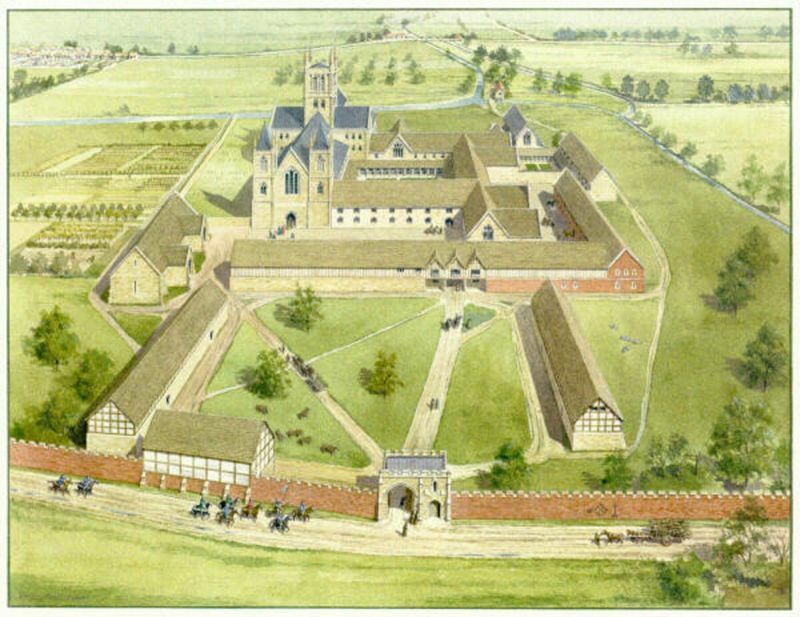 By 1617, although the congregation was stable and relatively secure, there were ongoing issues that needed to be resolved. Bradford noted that the congregation was aging, compounding the difficulties some had in supporting themselves. Some, having spent through their savings, gave up and returned to England. It was feared that more would follow and that the congregation would become unsustainable. The employment issues made it unattractive for others to come to Leiden, and younger members had begun leaving to find employment and adventure elsewhere. Also compelling was the possibility of missionary work, an opportunity that rarely arose in a Protestant stronghold. Edward Winslow‘s list was similar. In addition to the economic worries and missionary possibilities, he stressed that it was important for the people to retain their English identity, culture and language. They also believed that the English Church in Leiden could do little to benefit the larger community there. At the same time, there were many uncertainties about moving to such a place as America. Stories had come back from there about failed colonies. There were fears that the native people would be violent, that there would be no source of food or water, that exposure to unknown diseases was possible, and that travel by sea was always hazardous. Balancing all this was a local political situation that was in danger of becoming unstable: the truce in what would be known as the Eighty Years’ War was faltering, and there was fear over what the attitudes of Spain toward them might be. Candidate destinations included Guiana, where the Dutch had already established Essequibo, or somewhere near the existing Virginia settlements. Virginia was an attractive destination because the presence of the older colony might offer better security. It was thought, however, that they should not settle too near since that might too closely duplicate the political environment back in England. The London Company that administered Virginia covered a large area, so some distance would be possible. Robert Cushman and John Carver were sent to England to solicit a land patent. Their negotiations were delayed because of conflicts internal to the London Company, but ultimately a patent was secured in the name of John Wincob on June 9 (Old Style)/June 19 (New Style), 1619. The charter was granted with the king’s condition that the Leiden group’s religion would not receive official recognition. Because of the continued problems within the London Company, preparations stalled. The congregation was approached by competing Dutch companies, and the possibility of settling in the Hudson River area was discussed with them.These negotiations were broken off at the encouragement of another English merchant, Thomas Weston, who assured them that he could resolve the London Company delays. A second change was known only to parties in England who chose not to inform the larger group. New investors who had been brought into the venture wanted the terms altered so that at the end of the seven year contract, half of the settled land and property would revert to them; and that the provision for each settler to have two days per week to work on personal business was dropped. Also in July in Leiden, English ambassador Dudley Carleton became aware of the situation and began leaning on the Dutch government to extradite Brewster. An arrest was made in September, but only Thomas Brewer, the financier, was in custody. Brewster’s whereabouts between then and the colonists’ departure remain unknown. Brewster’s type was seized. After several months of delay, Brewer was sent to England for questioning, where he stonewalled government officials until well into 1620. One resulting concession that England did obtain from the Netherlands was a restriction on the press that would make such publications illegal to produce. Thomas Brewer was ultimately convicted in England for his continued religious publication activities and sentenced in 1626 to a fourteen year prison term. Not all of the congregation would be able to depart on the first trip. Many members would not be able to settle their affairs within the time constraints, and the budget for travel and supplies was limited. It was decided that the initial settlement should be undertaken primarily by younger and stronger members. The remainder agreed to follow if and when they could. Robinson would remain in Leiden with the larger portion of the congregation, and Brewster was to lead the American congregation. While the church in America would be run independently, it was agreed that membership would automatically be granted in either congregation to members who moved between the continents. With personal and business matters agreed upon, supplies and a small ship were procured. Speedwell was to bring some passengers from the Netherlands to England, then on to America where it would be kept for the fishing business, with a crew hired for support services during the first year. 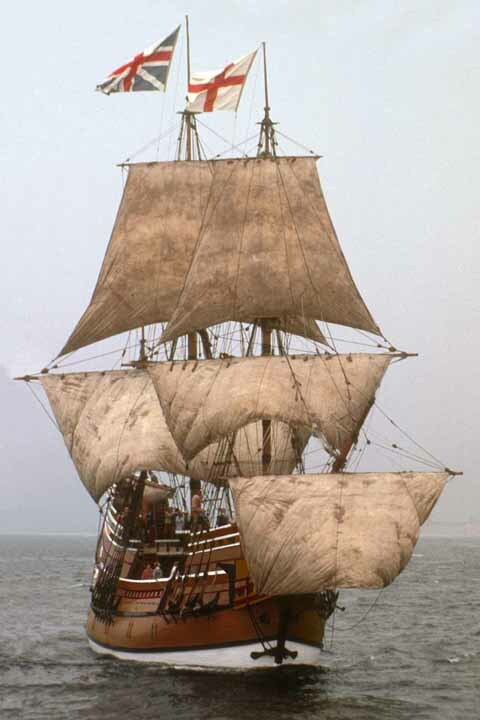 A second, larger, ship, Mayflower, was leased for transport and exploration services. In July 1620, Speedwell departed Delfshaven with the Leiden colonists. Reaching Southampton, Hampshire, they met with Mayflower and the additional colonists hired by the investors. With final arrangements made, the two vessels set out on August 5 (Old Style)/August 15 (New Style). Soon thereafter, the Speedwell crew reported that their ship was taking in water, so both were diverted to Dartmouth, Devon. There it was inspected for leaks and sealed, but a second attempt to depart also failed, bringing them only so far as Plymouth, Devon. It was decided that Speedwell was untrustworthy, and it was sold. It would later be learned that crew members had deliberately caused the ship to leak, allowing them to abandon their year-long commitments. The ship’s master and some of the crew transferred to Mayflower for the trip. Of the 121 combined passengers, 102 were chosen to travel on Mayflower with the supplies consolidated. Of these, about half had come by way of Leiden, and about 28 of the adults were members of the congregation. The reduced party finally sailed successfully on September 6/September 16, 1620. Initially the trip went smoothly, but under way they were met with strong winds and storms. One of these caused a main beam to crack, and although they were more than half the way to their destination, the possibility of turning back was considered. Using a “great iron screw” (probably a piece of house construction equipment brought along by the colonists, they repaired the ship sufficiently to continue. One passenger, John Howland, was washed overboard in the storm but caught a rope and was rescued. One crew member and one passenger died before they reached land. A child was born at sea and named “Oceanus”. Land was sighted on November 10/November 20, 1620. 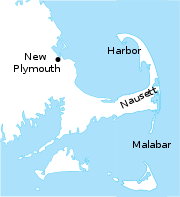 It was confirmed that the area was Cape Cod, within the New England territory recommended by Weston. An attempt was made to sail the ship around the cape towards the Hudson River, also within the New England grant area, but they encountered shoals and difficult currents around Malabar (a land mass that formerly existed in the vicinity of present-day Monomoy). It was decided to turn around, and by November 11/November 21 the ship was anchored in what is today known as Provincetown Harbor. With the charter for the Plymouth Council for New England incomplete by the time the colonists departed England (it would be granted while they were in transit, on November 3/November 13,) they arrived without a patent; the older Wincob patent was from their abandoned dealings with the London Company. Some of the passengers, aware of the situation, suggested that without a patent in place, they were free to do as they chose upon landing and ignore the contract with the investors. To address this issue, a brief contract, later to be known as the Mayflower Compact, was drafted promising cooperation among the settlers “for the general good of the Colony unto which we promise all due submission and obedience.” It was ratified by majority rule, with 41 adult male passengers signing. At this time, John Carver was chosen as the colony’s first governor. Thorough exploration of the area was delayed for over two weeks because the shallop or pinnace (a smaller sailing vessel) they brought had been partially dismantled to fit aboard the Mayflower and was further damaged in transit. Small parties, however, waded to the beach to fetch firewood and attend to long-deferred personal hygiene. While awaiting the shallop, exploratory parties led by Myles Standish—a Manx soldier the colonists had met while in Leiden—and Christopher Jones were undertaken. They encountered several old buildings, both European-built and Native-built, and a few recently cultivated fields. “They also found two of the Indian’s houses covered with mats, and some of their implements in them; but the people had run away and could not be seen. They also found more corn, and beans of various colours. These they brought away, intending to give them full satisfaction (repayment) when they should meet with any of them, – as about six months afterwards they did. By December, most of the passengers and crew had become ill, coughing violently. Many were also suffering from the effects of scurvy. There had already been ice and snowfall, hampering exploration efforts. During the first winter, 47% of them died. Explorations resumed on December 6/December 16. The shallop party—seven colonists from Leiden, three from London, and seven crew—headed south along the cape and chose to land at the area inhabited by the Nauset people (roughly, present-day Brewster, Chatham, Eastham, Harwich and Orleans), where they saw some native people on the shore, who ran when the colonists approached. Inland they found more mounds; one containing acorns, which they exhumed and left; and more graves, which they decided not to dig. The local people were already familiar with the English, who had intermittently visited the area for fishing and trade before Mayflower arrived. In the Cape Cod area, relations were poor following a visit several years earlier by Thomas Hunt. Hunt kidnapped twenty people from Patuxet (the place that would become New Plymouth) and another seven from Nausett, and he attempted to sell them as slaves in Europe. One of the Patuxet abductees was Squanto, who would become an ally of the Plymouth colony. The Pokanoket, who also lived nearby, had developed a particular dislike for the English after one group came in, captured numerous people, and shot them aboard their ship. There had by this time already been reciprocal killings at Martha’s Vineyard and Cape Cod. Samuel de Champlain‘s 1605 map of Plymouth Harbor, showing Wampanoag village Patuxet, with some modern place names added for reference. The star is the approximate location of the 1620 English settlement. Continuing westward, the shallop’s mast and rudder were broken by storms, and their sail was lost. Rowing for safety, they encountered the harbor formed by the current Duxbury and Plymouth barrier beaches and stumbled on land in the darkness. They remained at this spot—Clark’s Island—for two days to recuperate and repair equipment. Resuming exploration on Monday, December 11/December 21, the party crossed over to the mainland and surveyed the area that ultimately became the settlement. The anniversary of this survey is observed in Massachusetts as Forefathers’ Day and is traditionally associated with the Plymouth Rock landing legend. This land was especially suited to winter building because the land had already been cleared, and the tall hills provided a good defensive position. The cleared village, known as Patuxet to the Wampanoag people, was abandoned about three years earlier following a plague that killed all of its residents. Because the disease involved hemorrhaging] the “Indian fever” is assumed to have been fulminating smallpox introduced by European traders. The outbreak had been severe enough that the colonists discovered unburied skeletons in abandoned dwellings. [ With the local population in such a weakened state, the colonists faced no resistance to settling there. The exploratory party returned to Mayflower, which was then brought to the harbor on December 16/December 26. Only nearby sites were evaluated, with a hill in Plymouth (so named on earlier charts) chosen on December 19/December 29. Construction commenced immediately, with the first common house nearly completed by January 9/January 19. At this point, single men were ordered to join with families. Each extended family was assigned a plot and built its own dwelling. Supplies were brought ashore, and the settlement was mostly complete by early February. William Bradford became governor in 1621 upon the death of John Carver, served for eleven consecutive years, and was elected to various other terms until his death in 1657. The patent of Plymouth Colony was surrendered by Bradford to the freemen in 1640, minus a small reserve of three tracts of land. On March 22, 1621, the Pilgrims of Plymouth Colony signed a peace treaty with Massasoit of the Wampanoags. The colony contained roughly what is now Bristol County, Plymouth County, and Barnstable County, Massachusetts. When the Massachusetts Bay Colony was reorganized and issued a new charter as the Province of Massachusetts Bay in 1691, Plymouth ended its history as a separate colony. For over a century and a half after Bradford wrote this passage, there is no record of Pilgrims being used to describe Plymouth’s founders, except when quoting Bradford. When the Mayflower’s story was retold by historians Nathaniel Morton (in 1669) and Cotton Mather (in 1702), both paraphrased Bradford’s passage, and used Bradford’s word pilgrims. At Plymouth’s Forefathers’ Day observance in 1793, Rev. Chandler Robbins recited this passage from Bradford. Why Did the Pilgrims Come to the New World ? They disagreed with the religious teachings of the Church of England. In fact, the Pilgrims were members of a group of people called Separatists. These people had different beliefs than the rest of the English people. In 1606, they formed their own church in a small village called Scrooby. At this time, the Church of England was the same as the Government of England. In other words, King James I was the head of both the country and the church. Not belonging to the church meant not obeying the king. This was treason. So the Pilgrims left England, in search of a safe place to practice their religion. They chose to go to Holland and found a home in Leiden. For 12 years, they worshipped under their pastor, John Robinson. But the Pilgrims were also poor. Many of them were forced to work difficult jobs all day long, for little money. They had found religious peace in Holland, but they were making barely enough money to survive. They finally decided to sail to North America. They didn’t want to join the Jamestown colony, founded in 1607, because they feared that the English people there would treat them badly because of their religious beliefs. So the Pilgrims settled on the northern part of the Virginia Territory, at the mouth of the Hudson River (near what is now New York). Happily, the Pilgrims found businesspeople who were willing to give them money in exchange for a share of the profits made in America. The Pilgrims bought a small ship called the Speedwell and sailed back to England. They stayed long enough to get more colonists and a larger ship, the Mayflower. They set sail from Southampton on August 5, 1620. The ocean crossing was long and difficult. Many of the Pilgrims wondered if they would ever see land. Two people died, and one baby was born. On November 9, they saw land. Two days later, they dropped anchor at Cape Cod, which is now in Massachusetts. An advance party soon went ashore and looked for food and shelter, while most of the people stayed aboard the Mayflower. 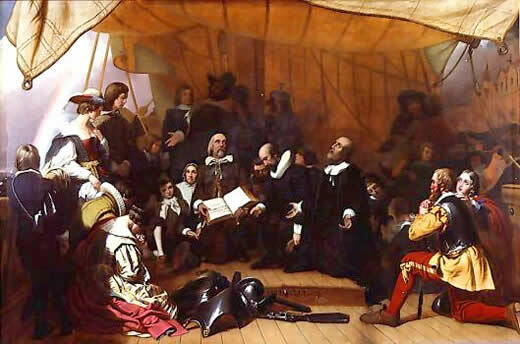 A group of Pilgrims, led by William Bradford, signed the Mayflower Compact, which said that they agreed to govern themselves and not take orders from other people. More scouting of the new land followed, and the entire group finally went ashore and began to build a settlement. It was December 23, and the place was Plymouth. The first winter was very hard. More than 40 people died. The rest of the Pilgrims made it through the winter. In the spring, they began to plant food and continued to explore their new home. On March 16, Samoset and another Native American entered the Plymouth settlement and said, in English, “Welcome, Englishmen.” The Pilgrims were amazed. Samoset explained that he had learned their language from English fishermen who had fished there in the winter. The two peoples exchanged greetings and ideas. They parted as friends. A few days later, Samoset returned with Squanto, another Native American leader. The Pilgrims welcomed him, too. Soon, Massasoit, the leader of the large tribe the Wampanoag, visited Plymouth. The two peoples signed a peace treaty that would last 50 years. The Native Americans had taught the Pilgrims how to plant wheat, barley, Indian corn, and peas. Soon, the settlement was growing lots of food. Later that year, in the fall, the Pilgrims celebrated the harvest. They invited their Native American friends to join them. This has become known as the first Thanksgiving. The Plymouth colony thrived. More people were born, and more people arrived from Europe. Soon, other colonies sprung up. It wouldn’t be long before English colonies filled the entire Eastern coast of North America. The Pilgrims, in seeking freedom from religious punishment and economic hardship, had found in the New World new friends and a new way of life.